Education Minister and joint Chairman of the New Right, in an interview with Arutz Sheva less than a day before the opening of the polling stations, talks about preparations and efforts to wake up voters. "The situation on the right isn't simple: The right-wing bloc stands at 67 seats, but Netanyahu's anguishing over specifically the New Right is liable to hurt us very much. It's not completely clear to me why he marked Ayelet Shaked and me, since it damages the entire bloc," says Bennett, noting that a blow to his party could lead to Ayelet Shaked, the best Justice Minister in the history of the State of Israel, as he puts it, to no longer be Justice Minister. In Bennett's assessment, the Israeli right is internalizing his efforts and those of Minister Shaked to block the possibility of establishing a Palestinian state, and this is precisely why Netanyahu is focusing on siphoning votes from his party. "It seems he's trying to remove the barrier to a Palestinian state." Bennett is unimpressed by Netanyahu's promises to impose sovereignty, noting that similar promises and statements were made by him also before previous elections. Bennett expressed concern about the Trump plan, which is expected to hatch immediately after the elections: "The right must wake up, and only Ayelet Shaked and I know how to stop it. When religious Zionism was alone, bulldozers came upon Gush Katif. "We're not perfect and we're not free of mistakes, but we're good people who want to do good for the people of Israel, and we hope the people of Israel will give us the power. We need to be strong and not on the edge," says Bennett, and on his party's attitude toward religious Zionism he makes clear that 60 percent of his party's voters come from the secular and traditional public, and only 40 percent from religious Zionism. "What came as a surprise to us was that Netanyahu was going after us, maybe because he doesn't want to deal with the Supreme Court and not deal with Hamas as I wanted. Perhaps it's more convenient for him for religious Zionism to be comprised of three seats." For Bennett, a vote for his party is critical, while the addition of one or two seats to the Likud or other parties is insignificant to the right-wing camp. "Without us, Netanyahu will go with Gantz and Lapid and we'll get a Lapid Defense Minister and a Gantz Defense Minister." 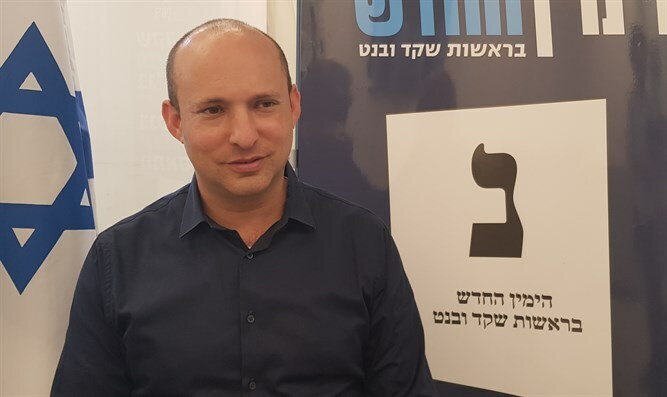 Minister Bennett rejects the Prime Minister's claim in an interview with Arutz Sheva that his position was that various reforms should be carried out in the legal system, but the legal and political constellation does not allow this. "Than's wrong. Netanyahu consistently said many times that he defended the Supreme Court and didn't allow any initiative to happen. This time he did it by giving Kahlon veto power, but Ayelet's no dummy. She's smart and has forged an alliance with the Bar Association and has appointed conservative and much more restrained judges. This time we'll change the whole lot if we have enough seats. We'll change the method of selecting judges and will pass their appointment to elected officials as is customary in the world." On the phenomenon of voting for Moshe Feiglin, Bennett admits that it's a surprise for him. "Feiglin's a good man, but we're revolutionaries in practice and not in words. 25 years Feiglin's in politics, including in the Knesset, and left no imprint: Look at us, we stopped a Palestinian state, I prevented the release of terrorists, I led in Protective Edge, I lead a revolution in education. Ayelet Shaked revolutionized the judicial system, and dismantled monopolies and cartels. Moshe Feiglin as an interviewee is nice, but we don't have time to indulge in these things. We have to guard our land." Minister Bennett warns of a reality in which his party will indeed pass the threshold, but won't reach enough seats to meet the challenges posed to his party. Bennett warns of a reality in which Lapid's position in the Justice Ministry will return the Israeli government to going back to destruction and uprooting. On the process of establishing his party, Bennett says the right-wing bloc was saved because seats on the right which remained below the blocking threshold wen to the Union of Right-Wing Parties, while one seat from Yair Lapid and Benny Gantz came to his own party. "We must vote New Right to save the Land of Israel. It's no joke. Otherwise Netanyahu will go to the places he was already in. He voted for the disengagement, he handed over Hevron, he froze all construction in Judea and Samaria with Ehud Barak beside him, and there's no difference between Barak and Gantz," he said. Bennett mentions that in 2013, Netanyahu called him last, after the results of the elections were announced, as well as in 2015. This is in contrast to Netanyahu's own words. "There is a limit to how much the public can be a sucker, how many times you can fall in the same trap. He'll be prime minister, that's already closed, but what will he do during the term? Only me and Ayelet Shaked. There's no-one else to stop it. I ask you to give your vote to letter נ, to the New Right, to preserve the Land of Israel, the people of Israel and the Torah of Israel, but in the proper way."